Well, I got 1 leg almost together. There's still allot of work to be done and painting. 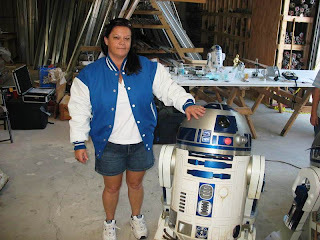 My wife volunteered her A&A motor holders so I could get R2 standing soon. I'll replace these for her R3 soon. Those two holes on the back of the leg hold the Booster in place and I'll get a white cover for them. 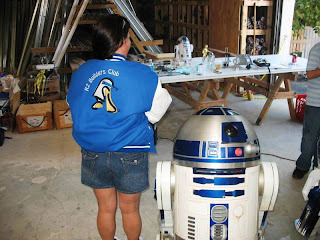 Now if I can get the other leg this far, I can see R2 stand for the first time. My Jag Ankles arrived today and I slid the parts together to see how they look. Can't wait to get everything painted and complete. 1st, I want to Thank Redeye for inviting us to the meeting. We had a wonderful time and it was very interesting learning about Trooper outfits. 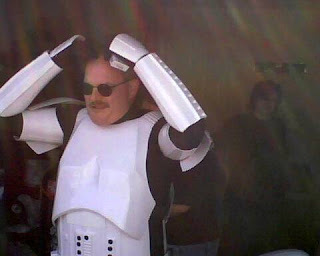 After R2 is finished and I build my Landspeeder, I will then build a Trooper outfit. Some of the people there, I remember from the Comic book meet and was glad to see them again. 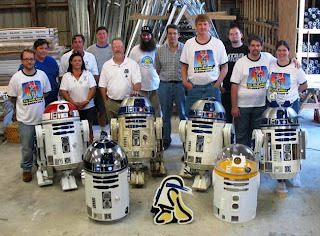 See you guys next time and maybe I'll have R2 finished. The pics show the face I put on the legs and the pocket holes. The pocket holes are not to spec, But it was the best I could do with what I had to work with as far as tools. I put the Shim and Booster on the leg to show what it will look like after I finish it. I'll have to do some putty work here and there to make the legs as smooth as possible. I attached the leg to R2 to see what he looks like with 1 leg so far. I've still got the skin the back of this leg, But I want to stop on this leg, So I can start on the other. I started applying the Styrene to the wood legs today and it's starting to look much better. I had almost gave up on the legs, But Johnathan gave me a good talking too and now I'm back at my work. Once I get the legs completely covered you won't know the legs are wood. I'll post more pics soon. I just want to Thank everyone for making this meeting WONDERFUL !!!!! that were brought to the meeting. together. We'll have a bigger building and will combine the local Comic book stores in with our meet to attract the public. 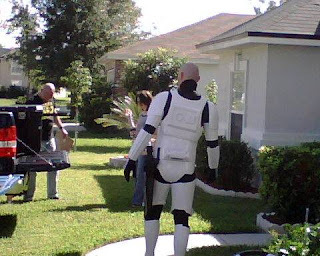 So, Shine up your droids and prepare for even more fun!!! Here's some pics from the Meeting. It was GREAT to see everyone again and I hope everyone had a good time. That's my Wife and her R3-T7 and you guessed it , That's me. Here's the rear Octo getting prepared for the blue paint. It will be a couple of days before I can do the blue, The white has to cure. Once I get this part done I'll add the doors and the rear skin will be almost complete. The other pic is inside R2. The panel I showed a month back is now installed in R2. It's made of clear/black Plexiglass, Once I get all the electronics together I'll add them to this area. 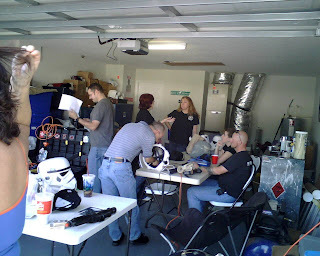 The group is putting together a meet here and I've been really busy getting the details together. 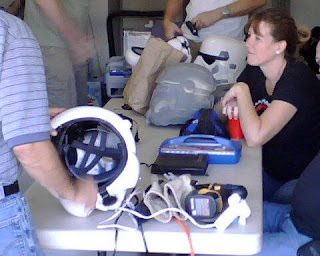 I have some updates to post on my R2, But it might be a couple of days before I can get them posted. Also my wife's R3 has updates. I will post some pics of the meet after it happens. So stay tuned for allot of pics to come.